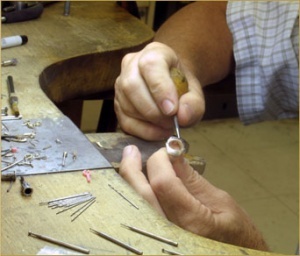 For over 60 years, Armand Jacoby has been a leader in jewelry design and manufacturing. We were one of the first in the industry to promote a branded jewelry line. Sold predominantly in the fine jewelry department of the leading department stores, Armand Jacoby was a forerunner of today’s “designer lines.” Today, we continue to shape the industry as we unite old world craftsmanship with modern technology to produce America’s finest 18kt and platinum diamond and colored stone jewelry. Even though fashion trends change, our philosophy remains constant. We believe that contemporary jewelry should embody the elegance of the classics as well as express the freedom and grace of modern fashion. Our jewelry is created to be worn as it blends beauty with classic and timeless designs. We continually strive to maintain the highest standard of excellence in styling, craftsmanship and service. As a result, our fine reputation has been earned over many years by our dedication to our customers.